Once again, canine influenza is making headlines in Kentucky. I learned about this new outbreak from the Kentucky Humane Society in Louisville. That agency's information came from WDRB-TV in Louisville, which reported that "there are more cases in Louisville than anywhere else in the country right now." The BluePearl Animal Hospital in Louisville told WDRB that new cases were arriving daily. Apparently the situation has reached the point where the hospital will not let affected dogs or their humans through the front door in order to minimize exposure for other animals in the clinic. Instead, animals showing symptoms are ushered into a quarantine trailer on the site. In addition, WDRB reported that a PetSmart location in the city had been calling customers to let them know that their pets had been exposed to the the disease. Friday night, July 21, I received a Twitter notification that the Kentucky Humane Society has a confirmed case of canine influenza at its main campus at 241 Steadly Dr in Louisville. As a result, the shelter facilities at that location have self-imposed quarantine and no dogs will be taken in during this time. On Saturday morning, July 22, I read the full notice on the agency's website. Fortunately, the KHS has been vaccinating shelter dogs for both strains of canine influenza since June 11. Now it's wait and see. If I learn anything more about this area of Kentucky, I'll try to keep you updated. "Misinformation about the dog flu has begun circulating on social media." This quote is from an updated statement the University of Florida College of Veterinary Medicine published on the school's website June 16. I have personally witnessed this several times and I think the misinformation keeps growing. Thus, recent conversations with friends who have dogs and reading posts on social media prompted me to write this short update on canine influenza or dog flu if you prefer. When I first wrote the article below, I researched the facts extensively to be sure I knew what I was writing about. I'd like to suggest that you read through this below or go to the CDC's website and read "Key Facts about Canine Influenza (Dog Flu)." Also, the references linked in the text of the article and listed at the end are what I think are reputable sources. Social media is not. Too many people who don't even have dogs chime in about something he or she heard from Aunt Betsy and Uncle John and so on. Now I'm not knocking social media. Anyone that knows me knows I enjoy participating daily. I love it. It's just not the place to get facts, especially for something as important as protecting our pets from illness and disease. 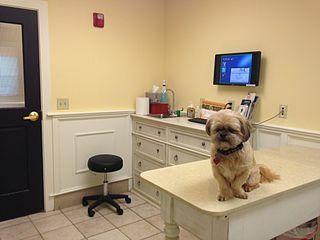 This week WBIR in Knoxville reported that the University of Tennessee College of Veterinary Medicine said no new cases of dog flu have been detected in the Knoxville area since the outbreak in June. However, some dog parks in Florida, a state with more than 100 confirmed cases of dog flu, remained temporarily closed and are not expected to reopen for three to five weeks, as of July 14, 2017. If anyone knows how things are in Frankfort right now concerning canine influenza, I'd love to hear. Unfortunately, because this affects animals and not humans, records and statistics are sparse. Dog Flu: What It Is? What Can We Do? Dog flu is spreading through Georgia after a dog show last month in Houston County, Ellen Eldridge, reported for the Atlanta Journal Constitution, on Thursday, June 8, 2017. In the AJC article, Eldridge wrote that local veterinarians said this disease is so contagious that it can be spread through a sneeze 20 feet away. The State, a newspaper based in Columbia, South Carolina, also reported on June 8, 2017, that health officials think the virus was spread at dog shows in Georgia and Florida and eight states had confirmed cases of the H3N2 strain of canine influenza. The confirmed cases were reported in Florida, Georgia, Illinois, Kentucky, North Carolina, South Carolina, Tennessee and Texas. Unfortunately, we have the virus here in my hometown, Frankfort, Kentucky. A local veterinarian's office that offers kennel services has been referring clients to me this past week so that dogs can stay in their own homes because of the virus. Dogs housed in enclosed spaces with other animals are much more susceptible to the virus than dogs housed alone. Extremely contagious among dogs, canine influenza is spread through respiratory secretions. As stated previously, the virus can travel through the air for up to 20 feet. It can live on hard surfaces for up to 48 hours; less on soft surfaces. Humans can spread canine influenza on our hands and clothes and by transporting the virus on leashes, harnesses, food and water bowls and other infected objects. Although it has been previously thought that the virus cannot be passed to other species of animals including humans, there have been reports of cats in shelters suffering from the virus. Canine influenza, or dog flu, is caused by infection with the H3N8 or H3N2 strains of influenza virus Symptoms include coughing, sneezing, fever, loss of appetite, weakness and general discomfort. An infected dog may also experience a runny nose or runny eyes. Dr. Scott Tritsch, with the Central Kentucky Veterinary Center in Georgetown, KY, told WKYT-TV news reporter Kristen Kennedy, that the flu looks like kennel cough in the beginning. However, symptoms worsen quickly in severe cases. A mild case of dog flu typically last from 10 to 30 days and the animal improves on its own with symptoms gradually going away. Treatment includes a cough suppressant and antibiotics. In severe cases of infection with the virus, symptoms typically develop quickly. The animal presents with a high fever and may have trouble breathing as blood from the capillaries in the lungs fills the air sacs. The infection may develop into pneumonia causing yet more complications and threatening the animal's health further. Treatment for more severe cases of canine influenza includes broad-spectrum antibiotics, cough suppressants and intravenous liquids. Hospitalization may be necessary. For both mild and severe cases of dog flu, it is vital that your pet be isolated from other animals and in an environment that facilitates rest. Not all dogs exposed to the virus show symptoms. However, those that do typically exhibit signs of the illness within 48 hours of exposure. If left untreated, a dog can develop pneumonia and die. Blood tests and other lab work are utilized to diagnose canine influenza. Infected dogs can spread the virus for up to four weeks. Therefore, if your pet tests positive for canine influenza, quarantine is absolutely necessary. Vaccines for canine influenza are available. If you feel like your pet may be at risk, contact your veterinarian immediately. She or he can help you decide if a vaccination is necessary. If your vet recommends vaccination, it is administered in two doses scheduled two weeks apart. Although the vaccinations doesn't always prevent the illness, it can greatly reduce its severity. If dog flu has been reported in your area, you should consider avoiding public places with your pets for the time being, especially dog parks and other areas where numerous animals congregate.